The wolf. A mysterious and controversial carnivore, persecuted throughout history, often misunderstood. Despite their centuries-long absence from the British Isles, wolves (Canis lupus) lurk in the human psyche from an early age, permeating folklore all around the world. What British child reaches the age of five without knowledge of the Big Bad Wolf? How many Welsh campfires have played host to the tale of brave Gelert and the ferocious wolf? Though feared, many a human heart would thrill to hear the baleful howl of a wolf on a moonlit, starry night. Ceredigion, and wider Wales, are currently unsuitable for wolf reintroduction due to high volumes of livestock, and much would need to change before their spine-tingling cry could ring through the Cambrian hills. Wolves have a fearsome reputation that colours public opinion and as such, the reintroduction of the wolf remains a hot potato in rewilding debate. Public concerns include the attack of humans and livestock, wolf population management and the snugness of the British Isles, bringing wolves and humans closer than in, say, the yawning landscapes of Canada and the USA. On the other hand there are proven ecological benefits to the presence of wolves. Wolves were famously released in Yellowstone National Park in 1995-96, and since the reintroduction of this apex predator, a fascinating change to the trophic network has occurred. Wolves in Yellowstone prey primarily on elk (the North American term for red deer), and their reduction has allowed willow and aspen to flourish, creating more woodland cover. A domino effect has seen an upsurge in beavers, bison and songbirds. A similar effect may help with the problems caused by elevated numbers of red deer in the Highlands of Scotland. Wolf numbers are recovering across Europe. Packs often live close to well-populated areas, and the species has even returned to Holland and Belgium. Intelligent management can help to resolve human-wolf conflicts, but where this is less well managed, for example in the French Alps, there can be problems. Unfairly, fiction and folklore vilify wolves. Myth has merged with history, and accounts of wolf attacks have been recorded in Wales. In 1790, a well-documented story tells of a werewolf-attack on a stagecoach travelling between Wrexham and Denbigh. Other accounts tell of a wolf with strangely human eyes attacking animals and people in north Wales around the same time. In the fourth branch of the Mabinogion the ruler of Gynwedd, Math, punishes his two unruly nephews by turning them into a wolf and a she-wolf, banishing them to the wilderness in this form for a year. In Norse mythology, Fenrir is an enormous, terrifying wolf who is kept shackled, but eventually kills the God Odin. Wolves have a historical association with grave-digging, earning them a reputation from the church that they were in league with the Devil himself. These fears have trickled through generations, and even though Britain’s last wolf likely disappeared in the 1600’s, they remain a feared, misunderstood species, with an undeserved reputation. Wolf fact and fiction seems to mingle imperceptibly, more so than with any other creature. The mythic rendering of wolves as monsters is misleading; human attacks are extremely rare. In fact, in the US you are more likely to be killed by a cow than a wolf! Conversely, other traditions favour the wolf. Inuit people venerate them, regarding them superior, possessors of magical powers and superb hunting skills. Inuit will avoid uttering the word amaruk (wolf in their native tongue), believing animals can hear you when you use their name. 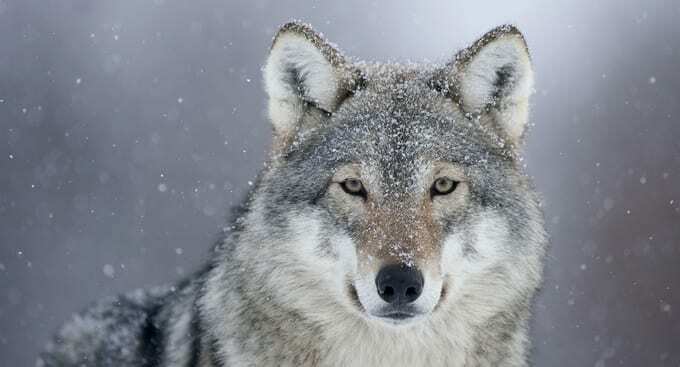 Wolves are highly revered in Native American cultures, associated with courage, strength, loyalty and hunting prowess. Tribes admire wolves’ cooperative hunting and family devotion, and the animal is featured in some of their creation myths, in tales of early ancestors being transformed from wolves to men. This admiration is well-placed, as wolves are indeed excellent co-operative family units, with firm hierarchies. The pack raise new-born pups together, of which 1-6 a year are born, protecting and feeding the suckling female, who gives birth in a burrow, one she either digs herself, or steals from a fox! Packs usually consist of a breeding pair and their offspring from previous years, who stay with their parents for around two years. Wolves can live for 6-8 years in the wild. Fully grown wolves stand up to a metre high at the shoulder, and are 1.8-2 metres long, usually with greyish brown coats, although colours can vary from white to black. Their widely varying habitat includes mountain, woodland, tundra, scrubland and plains, and occasionally urban areas. Their diet also varies and includes ungulates, mammals, birds, reptiles, plants and fruit. Wolves often consume vast quantities in one sitting. The reintroduction of wolves has been the subject of lively discussion for many decades. The media often misrepresents and sensationalises the debate, reporting extremes of opinion and further polarizing the argument. That said, public opinion seems to be slowly warming to wolves, and the main opponents are farmers whose livelihoods depend on the protection of their livestock. Studies show that attacks on livestock are low when abundant wild food sources are available, however, wolves do pose some risk to humans and livestock, and so wide public consent would be needed before reintroduction could be considered. Whilst Wales is unsuitable for wolves due the prevalence of livestock, the larger areas of wilderness in Scotland may one day prove an ideal location for wolf reintroduction. It is a debate that is likely to stretch well into the future and in the meantime, we can only gaze at the full moon, dreaming.